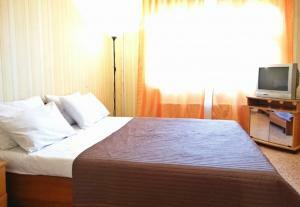 A-HOTEL.com - Luxury and cheap accommodation in Yasenki, Russia. Prices and hotel, apartment booking in Yasenki and surrounding. This indicative offer was derived from the most recently booked accommodation in Yasenki and sort by the price, from cheapest Yasenki accommodation to the most expensive hotels. To select accommodation by your preferences we recommend to choose from 1 accommodation offers in Yasenki in total. By entering the dates of your overnight stay in Yasenki and using the filter tools you can sort the best possible accommodation for you. The entered dates of your stay are crucial for the most accurate offer as it derives all the online information on pricing and availability of Yasenki accommodation. Then you can book the selected Yasenki lodging (hotels, apartments etc.) immediately. Featuring free WiFi, a children's playground and a sun terrace, Park Hotel Yasenki offers accommodation in Yasenki. Guests can enjoy the on-site restaurant. Voronovo Club Hostel is offering accommodation in Voronovo. Featuring a 24-hour front desk, this property also provides guests with a restaurant. Situated in Voronovo, Hotel Dacha has barbecue facilities, garden and free WiFi. Boasting a 24-hour front desk, this property also provides guests with a restaurant. Located 37 km from Moscow on the A101 Highway, Voronovo Klub offers free WiFi and free private parking. All rooms are air conditioned and come with a flat-screen TV. Offering a football field and table tennis, The White Alleys Holiday Park is surrounded by greenery and provides a large territory for walking. Free WiFi access is available in this holiday park. Sanatoriy Voronovo offers accommodation in Voronovo. The property offers a variety of treatment programs and specialises in respiratory and cardiovascular diseases, nervous disorders and diseases of the musculoskeletal system. Set in Kiselevo, Hotel Vitro Villadzh features barbecue facilities and garden. Boasting a shared kitchen, this property also provides guests with a children's playground. Inndays 65 лет Победы д.8 корпус 2 in Podolsk features accommodation with free WiFi, 14 km from Vityaz Skating Arena and 16 km from Ivanovskoye Estate. Featuring free WiFi and a restaurant, Country Club Fisherix offers accommodation in Ovechkino. The hotel features the on-site Fishka children's club and an open children's playground. Located in Krasnoye, Country house in Lesnoe Ozero is a self-standing house that offers a tennis court. This self-catering unit features free WiFi. Guests can enjoy the on-site restaurant. Free WiFi is provided throughout the property and free private parking is available on site. Holiday Park on Yuzhnaya 78 offers barbecue facilities, as well as accommodation with a kitchenette in Sharapovo. The accommodation features a sauna. Country House on Beloye Ozero is a country house in Filippovskoe with access to a private beach area and a terrace. This country house features a shared lounge, a bar as well as free WiFi. Offering a stable with 18 horses, Karavan Riding Holiday Centre is located in natural surroundings in Inino Village, a 3-minute walk from the bank of the Kremenka River. Free private parking is available in this holiday park. Eco-Farm Polesye is set in Inino. There is also a kitchenette in some of the units equipped with a microwave. Guesthouse na Lyvovskoy is located in Podolsk, 28 km from the Moscow Ring Road. You will find a kettle in the room.